2 Lamb shanks slow cooked for 10 hours, with chilli and aromatic spices. Inspired by recipes from North Africa. Ready to eat in 40 minutes Serves 2. Our lamb shanks have been marinated in a harissa paste whilst being slow cooked for 10 hours for you, so the meat is succulent and tender; all you have to do is finish in the oven for 40 mins. Our lambs graze naturally on open pastures producing the best quality seasonal lamb which is expertly prepared and matured for tenderness and flavour. 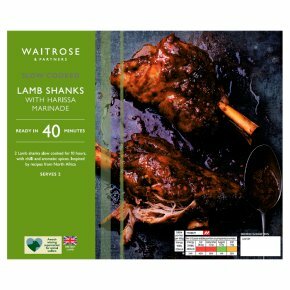 INGREDIENTS: Lamb shanks (88%), red chilli (4%), garlic, cornflour, olive oil, tomato paste, ground coriander, sea salt, preservative (acetic acid), paprika, ground cumin, ground caraway seeds, dried mint.